American Airlines AAdvantage Dining Program: VIP members (dining program members who elect to receive emails and have 12 qualified transactions in one calendar year) earn 5 miles per dollar spent at participating restaurants, online members earn 3 miles per dollar spent after opting to receive AAdvantage dining program emails, and regular members with no online profile earn 1 mile per dollar spent. Qualified transactions are dines at participating restaurants that occur during a valid benefit period and are paid for with a credit or debit card registered with the AAdvantage Dining program. New member bonus – join and register for the New Member Bonus by December 31, 2014 and earn 2,000 AA miles after completing a review of your first (minimum of $30) meal within 30 days of dine. Earn double miles at rotating list of restaurants, bars, and clubs. Alaska Airlines Mileage Plan Dining: VIP members (dining program members who elect to receive emails and have 12 qualified transactions in one calendar year) earn 5 miles per dollar spent at participating restaurants, online members earn 3 miles per dollar spent after opting to receive Alaska Airlines dining program emails, and regular members with no online profile earn 1 mile per dollar spent. Qualified transactions are dines at participating restaurants that occur during a valid benefit period and are paid for with a credit or debit card registered with the Mileage Plan Dining program. New member bonus – join and register for the New Member Bonus by December 31, 2014 and earn a bonus 500 Alaska Airlines miles after spending a minimum of $25 at a single participating vendor within 30 days of registration. Earn double miles at a rotating list restaurants, bars, and clubs. Delta Skymiles Dining: VIP members (dining program members who elect to receive emails and have 12 qualified transactions in one calendar year) earn 5 miles per dollar spent at participating restaurants, online members earn 3 miles per dollar spent after opting to receive Delta dining program emails, and regular members with no online profile earn 1 mile per dollar spent. Qualified transactions are dines at participating restaurants that occur during a valid benefit period and are paid for with a credit or debit card registered with the Skymiles Dining program. New member bonus – join and register for the New Member Bonus by December 31, 2014 and earn 2,500 additional Delta Skymiles after spending a minimum of $30 at participating vendors in single dine (and completing a review of restaurant) within 30 days of registration. Southwest Rapid Rewards Dining: Active members who provide an email address to receive Rapid Rewards dining program emails receive 3 points for every dollar spent at participating restaurants, bars, and clubs.Earn an additional 10 points for every review completed within 30 days of dine. New member bonus: register and spend $25 on a single dine within 60 days and complete a review within 30 days of meal and receive 300 additional Southwest Rapid Rewards points. First step bonus – earn a 500 mile bonus when your dining point balance reaches 1,500 miles after qualifying dining activities (first step bonus can only be earned once). After earning the new member and first step bonus continue participating to earn SW’s thank you bonus which awards an additional 300 points every time a member’s dining points balance reaches 1,000 (not including bonus points). Thank you bonus can be earned repeatedly. United MileagePlus: VIP members (dining program members who elect to receive emails and have 12 qualified transactions in one calendar year) earn 5 miles per dollar spent at participating restaurants, online members earn 3 miles per dollar spent after opting to receive United dining program emails, and regular members with no online profile earn 1 mile per dollar spent. Qualified transactions are dines at participating restaurants that occur during a valid benefit period and are paid for with a credit or debit card registered with the United MileagePlus Dining program. New member bonus – join and register for the New Member Bonus by December 31, 2014 and earn 1,500 additional United MileagePlus after spending a minimum of $30 at participating vendors in single dine (and completing a review of restaurant) within 30 days of registration. Earn double miles at a rotating list of restaurants, bars, and clubs. US Airways Dividend Miles Dining: VIP members (dining program members who elect to receive emails and have 12 qualified transactions in one calendar year) earn 5 miles per dollar spent at participating restaurants, online members earn 3 miles per dollar spent after opting to receive US Airways dining program emails, and regular members with no online profile earn 1 mile per dollar spent. Qualified transactions are dines at participating restaurants that occur during a valid benefit period and are paid for with a credit or debit card registered with the US Airways Dividend Miles Dining program. 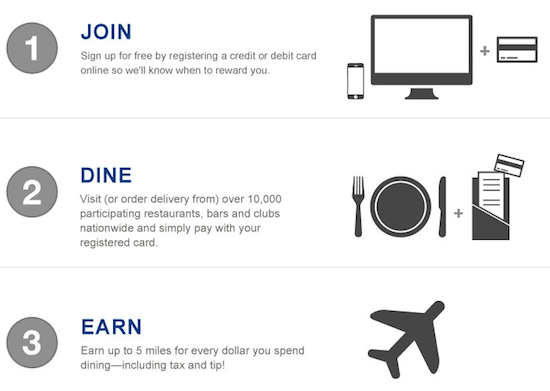 New member bonus – join and register for the new member bonus by December 31, 2014 and earn a bonus 2000 miles after spending $30 at a single participating restaurant within 30 days of joining and completing a review within 30 days of dine (bonus can be repeated for a total of 1,000 bonus miles). Earn double miles at a rotating list of restaurants, bars, and clubs. Hilton Hhonors Dining: Elite level members (dining program members who elect to receive emails and have 12 qualified transactions in one calendar year) earn 8 points per dollar spent at participating restaurants, online members earn 5 points per dollar spent after opting to receive Hilton Hhonors dining program emails, and regular members with no online profile earn 2 points per dollar spent. Qualified transactions are dines at participating restaurants that occur during a valid benefit period and are paid for with a credit or debit card registered with the Hilton Hhonors Dining Program. New member bonus – join and register for the new member bonus by December 31, 2014 and earn an additional 1,000 Hhonors points after spending $30 on any single dine within 30 days of joining and completing a review within 30 days of meal(s). Earn double points at a rotating list of restaurants, bars, and clubs. Priority Club Rewards Dining: Elite level members (dining program members who elect to receive emails and have 12 qualified transactions in one calendar year) earn 8 points per dollar spent at participating restaurants, online members earn 5 points per dollar spent after opting to receive Rewards dining program emails, and regular members with no online profile earn 2 points per dollar spent. Qualified transactions are dines at participating restaurants that occur during a valid benefit period and are paid for with a credit or debit card registered with the Priority Club Dining Rewards program. New member bonus – join and register for the new member bonus by December 31, 2014 and earn an additional 1,000 Priority Club points after spending $30 during a single visit to a participating restaurant within 45 days of joining and completing a review within 30 days of meal. Earn double points at a rotating list of restaurants, bars, and clubs.